Background: A lot of advancement has been made in the area of β-lactams in recent times. Most of the research is targeted towards the synthesis of novel β-lactams, their functionalization and exploring their biological potential. The C-3 functionalization of β-lactams has continued to attract considerable interest of the scientific community due to their utility as versatile intermediates in organic synthesis and their therapeutic applications. This has led to the significant increase in efforts towards developing efficient and economic strategies for C-3 functionalized β-lactams. 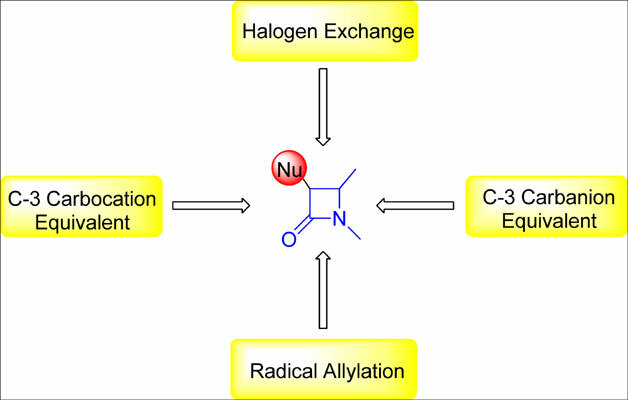 Objective: The present review aims to highlight recent advancement made in C-3 functionalization of β - lactams. Conclusion: To summarize, functionalization of β-lactams at C-3 is an essential aspect of β-lactam chemistry in order to improve/modify its synthetic utility as well as biological potential. The C-3 carbocation equivalent method has emerged as an important and convenient strategy for C-3 functionalization of β-lactam heterocycles which provides a wide range of β-lactams viz. 3-alkylated β-lactams, 3-aryl/heteroarylated β-lactams, 3- alkoxylated β-lactams. On the other hand, base mediated functionalization of β-lactams via carbanion intermediate is another useful approach but their scope is limited by the requirement of stringent reaction conditions. In addition to this, organometallic reagent mediated α-alkylation of 3-halo/3-keto-β-lactams also emerged as interesting methods for the synthesis of functionalized β-lactams having good yields and diastereoselectivities. C-3 functionalization, β-lactam, C-3 carbocation, C-3 carbanion, α-allylation, grignard reagent.